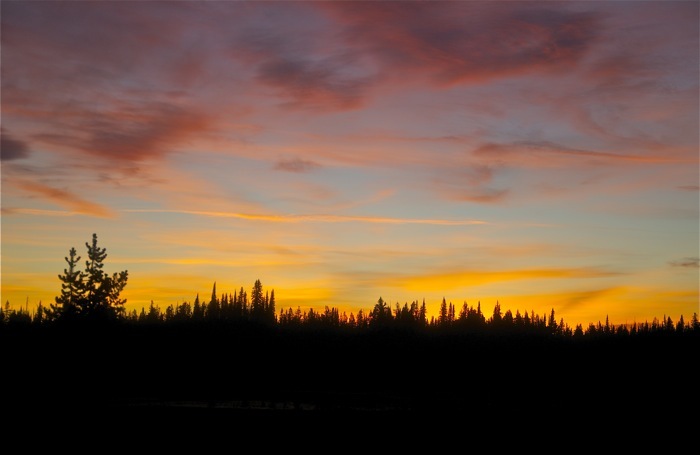 Big Wild Adventures offers fully outfitted guided backpacking in the most beautiful wilderness lands of the American West and Alaska. 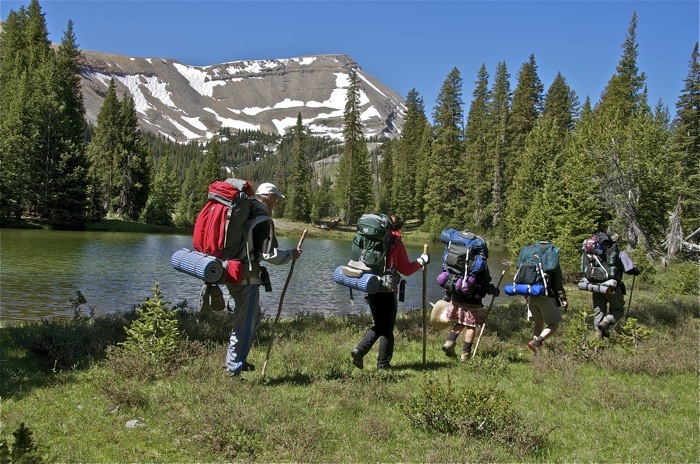 We offer backpacking tours in Yellowstone National Park, the Grand Tetons, and many other areas in Montana and Wyoming, although we are best known for our Yellowstone backpacking trips and hikes. We also canoe the watery wilds of the remote upper Missouri River in north-central Montana. We are a family business, owned by Howie Wolke and Marilyn Olsen with occasional help from our son Josh. Howie founded Big Wild Adventures in 1978 and has personally guided over 500 treks and hikes, so far. Our guides are our “extended family”, and all share a deep love of Yellowstone, the wilds and a commitment to share their knowledge and know-how with our clients. Howie and Marilyn live in their home where they work in their solar-powered office, in Montana’s Gallatin Range foothills, just north of Yellowstone National Park. Year 41 – And Still Co-owned by the Founder! Please note that we do not offer lodge-based day-hikes or vehicle-based road tours. All of our guided hiking/trekking tours are multi-day wilderness adventures, backpacking (or canoeing) in a primitive environment, tent-camping on all trips in magnificent true wilderness! This means that everyone carries a backpack including tent, sleeping bag and a portion of the group food. We offer a real old-fashioned primitive wilderness experience! Just show up and leave all of the trip details to us. All advertised trip prices include our complete equipment package plus food (3 meals/day plus snacks), cooking gear, meal preparation, trip planning and taxes/user and entry fees, pre-trip safety instruction, transportation from town to and from trailheads, and the services of our expert guide/naturalist staff. Once you sign up for a trip and receive confirmation, we guarantee that the trip will run, regardless of the number of folks who have signed up. We will not cancel your vacation plans! Read This: Big Wild co-owner Howie Wolke is the subject of a feature article in the Spring 2016 issue of Outside Bozeman magazine. To view the online version, please click here. Big Wild guides are the best in the business with decades of wilderness leadership; they are not inexperienced young adults. Our guides are trained in wilderness medicine and emergency rescue procedures. 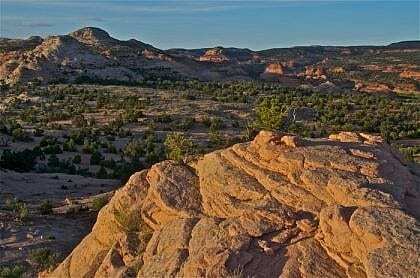 They are great naturalists who enjoy sharing their knowledge of each area’s unique flora, fauna and geology; they are also glad to provide any desired instruction in wilderness skills. We don’t just live next to Yellowstone National Park, we know the wonders of the expansive Yellowstone backcountry better than anyone! Though most tourists never venture far from their automobiles, our Yellowstone backpacking treks are in true wilderness. In fact, because much of Yellowstone is bordered by large protected national forest Wilderness Areas, Yellowstone’s back- country includes some of our country’s most remote wild lands south of Alaska. And the Yellowstone hiking terrain is so varied that each trip is radically different, a truly unique wild adventure. Join us on one of our guide/naturalist-led Yellowstone trips into the wild back-country of the world’s first national park. In our Yellowstone guided hiking, you will experience the real Yellowstone, including vast herds of elk and bison to wolves and bear in a spectacular land of wildflower-filled meadows and expansive forest beneath snow-covered mountains. Our Yellowstone guided hikes are second to none and include: Northern Yellowstone Wildlife and Wildflower Extravaganza, The Lamar River Backcountry, Northeast Yellowstone Mellow Magic Mountain, Yellowstone Plateau Wild Off-Trail Trek, Northwest Yellowstone Gallatin Range, Southwest Yellowstone Bechler Waterfall Wonderland, Southern Yellowstone Late Summer Magic and Northern Yellowstone Autumn Splendor. Unlike some other companies, our prices include entry fees to Yellowstone and all of our trip areas. 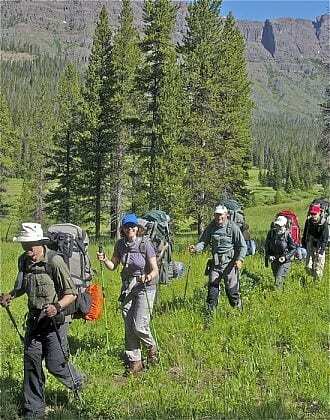 Big Wild Adventures has been authorized by the National Park Service for 39 years of Yellowstone backpacking. Our Yellowstone hikes are the best! And in addition to our Yellowstone guided tours, we also explore many other magnificent wild lands (including Montana backpacking and backpacking in Wyoming guided tours) throughout the American West and Alaska. If you wish to explore the real Yellowstone (its wild back-country), don’t settle for less! 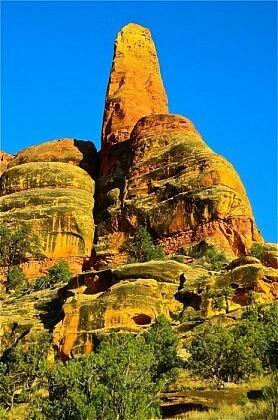 We specialize in remote and off the beaten track! We do not view wilderness as an “outdoor gymnasium.” Instead, we provide the opportunity for a real old-fashioned wilderness experience. And a profound respect for wilderness-dependent life and land is fundamental to our operation, both on Yellowstone backpacking trips and all other adventures in the big wilds. Scheduled Hiking Trips are generally for anybody at least 14 years of age – individuals, couples, groups of friends, parents/relatives with young adults – and provide a unique small group experience in some of the world’s most magnificent wilderness areas! There is a list of scheduled trips by region on the right side of every internal page of this website. View scheduled trips. 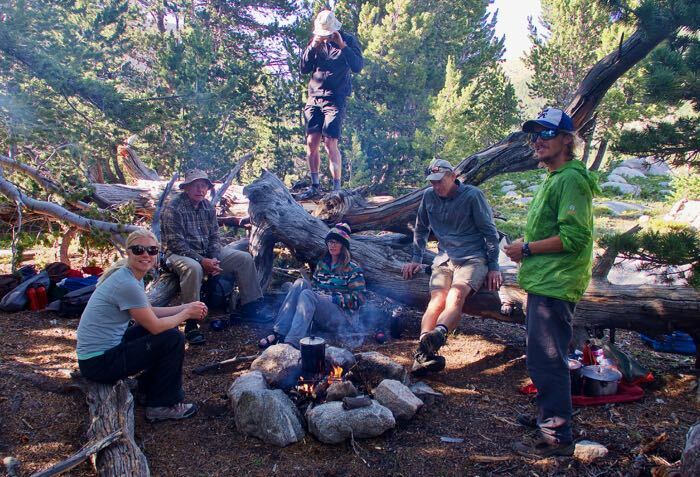 Custom and Family Backpacking Trips are a private wilderness experience with your group and our guide, and can be scheduled for any of our regular guiding areas. This includes our Yellowstone backpacking trips, backpacking in Montana and Wyoming backpacking and more. Remember, some areas are best enjoyed at certain times of the year. We can also run Custom and Family Trips in other areas, too. We’d love to suggest some great trip alternatives for your time slot! A Family trip is a great way to bond, and we love to get young people out into the wilds! Read more about our Custom and Family trips. 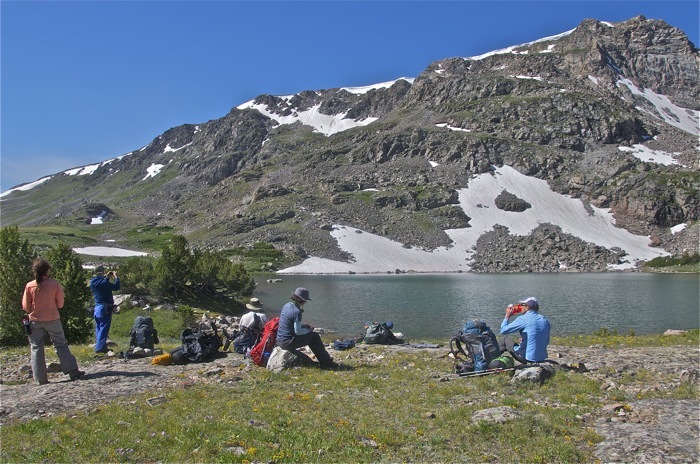 Big Wild Adventures offers top notch Montana and Wyoming backpacking, Yellowstone guided hikes, and guided hikes in several other states including Alaska. We supply state of the art equipment. Bring your own gear (backpack/rain-cover, lightweight day-pack, tent, sleeping bag & pad, cup/bowl/spoon) for a $300 discount. There’s also a $300 discount for a second trip in a calendar year. Commission available for travel agents. Note: At Big Wild, we don’t need to purchase photos for our website. All photos on this website are by Big Wild Adventures owners Howie Wolke and Marilyn Olsen or in a few cases, other Big Wild guides. Nearly all were taken while guiding Big Wild trips.